Bring your dream backyard alive with recycled furniture from the outdoor furniture range at Outdoor Furniture Online! Your outdoor area is where you can relax and enjoy the open air after a long week and likewise where you’ll get together with family and friends throughout the year. The Recycled Timber Table SF is slightly wider coming in at 1300mm and offers plenty of room for diners. The massive 4 x 4 cross legs splayed out were an ideal choice, but didn’t take away from the table top being set back a little from the table ends. The table top has a larger than normal router edge, worked well with width of table and you can barely notice difference to usual router edge we use on other tables. 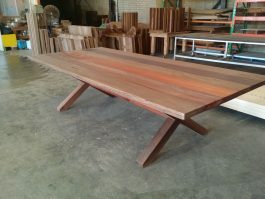 This Recycled Timber Table SF was made to order and can be reproduced to suit your size, style, colour or timber choice. This is one of those times when less is more, and while the Recycled Timber Table TM is small compared to other tables, it’s still a heavy table!! We never know what timber we’re going to salvage, and quite often it comes complete with wire, nails, bolts and even old hinges still embedded or sticking out of it. To eliminate the danger of our tools hitting a metal object as we assemble, we run a metal detector over the timber. Even though old metal is removed, or smacked back in to the timber in some cases, we try and leave as many of the old age imperfections still present to feature. 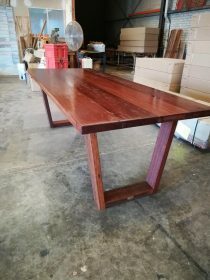 This Recycled Timber Table TM was made to order and can be reproduced to suit your size, style, colour or timber choice. It was fun creating this Recycled Timber Table BA in conjunction with a young couple who were choosing it as a wedding gift from their family. 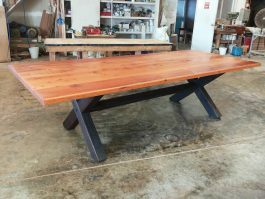 Reclaimed Oregon lengths, sanded back to a smooth finish, formed the top which allowed lots of table space. Clever use of farmhouse 4 x 4 criss cross legs in mixed hardwoods gives ample room for seating around the Recycled Timber Table BA without restrictions to diners. This table can be reproduced to suit your size, style, colour or timber choice. Legs can be criss cross or square. 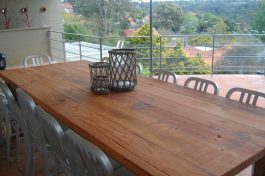 This Recycled Timber Table FO was our first recycled table and it’s been the precedent for so many more recycled pieces of furniture. Its style could be best described as a farmhouse table, the Recycled Timber Table FO is simple, yet variations in the timber make it gorgeous. The Oregon timber used for the table top is good for indoors or semi outdoors (under cover). 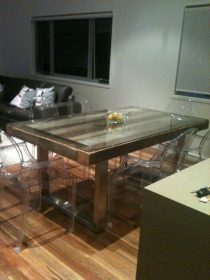 This Recycled Timber Table FO was made to order and can be reproduced to suit your size, style, colour or timber choice. This Recycled Timber Table KK is industrial meets contemporary. Match in a metal chair if you prefer or have a couple of miss matched chairs. Mixing and matching makes dining sets versatile, and brings out an individual taste. The advantage is you get to use them for extra seating elsewhere in your living spaces. Old Oregon was sourced for this Recycled Timber Table SL top, complete with nooks and crannies that we were asked to leave as features on top. Very simple industrial look completed with twelve robust aluminium ‘old navy’ side chairs. 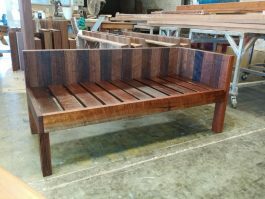 A rustic Recycled Timber Day Bed came about to match a recycled table we’d made for the client previously. The arm rest at either end or both ends, doesn’t matter when they’re made to order. We’ve reproduced this day bed with no back and was very practical ottoman. Reclaimed mixed hardwoods are a highlight of the larger-plank-size top on the Recycled Timber Table SB pictured. To keep costs and the weight down (because it was 5mt x 1.1mt with three sets of legs) we suggested using one of our regular in store timbers Cypress rough sawn 4 x 4’s for the criss-cross legs and the result was spot on.